What Do Sell-By Dates Actually Mean for Food Safety? Here’s one stupidly simple way to cut your food costs at home: Stop throwing away so much food. That may seem obvious, but you could actually be tossing perfectly good food without realizing it. If you’ve been following sell-by dates on labels in the name of food safety, you may be wasting a ton of food — and that food waste is costing you money. “There is no uniform or universally accepted system used for food dating in the United States,” the USDA explains. Except on baby formula, no federal regulations even require companies to include sell-by or use-by dates on food. For those companies that do, nothing regulates when those dates should be or what they actually mean. At least 20 states require dating of some kind on food labels, but without a consistent system or actual safety guidelines, most of us don’t know what to make of any of it. “Before taking a swig of milk, many Americans glance quickly at the date label and toss it away, without realizing that it still may be perfectly safe to consume,” said Sen. Richard Blumenthal (D-CT), who recently drafted food labeling legislation with Rep. Chellie Pingree (D-ME). “Items at the grocery store are stamped with a jumble of arbitrary food date labels that are not based on safety or science,” he added. Each year, the U.S. wastes $162 billion in food — most of it at home, and a lot of it unnecessary, reports Think Progress. Depending on the regulations in your state and the whims of certain manufacturers, your food’s packages could display at least one of several labels used across the industry. Sell-By Date: a month/date/year that tells a store how long to display the product for sale. It’s based on when a manufacturer believes food will be freshest. Closed or Coded “Date”: a packing number the manufacturer uses to track a product in transport and in case of a recall. Stores often use these packing numbers to learn when a product was packaged and delivered to determine how long to keep it on the shelf. Expiration (EXP) Date: Egg cartons with the USDA grade shield must display a “pack date,” the date they went in the carton. Some states also require eggs be stamped with an “expiration” date, which is scary-sounding but effectively a sell-by date. None of these dates have anything to do with food safety. Manufacturers set sell-by or use-by dates based on when they believe food will be freshest, and coded dates are irrelevant to consumers. Even on baby formula, the required use-by date refers to quality — the amount of nutrients and the consistency of the formula — not the potential for contamination or spoilage. The manufacturer, not the government, sets the date. In all of these cases, the date or code on a package tells stores how long to display products. It doesn’t tell consumers when food will go bad. “After the date passes, while it may not be of best quality, refrigerated products should still be safe if handled properly and kept at 40 °F (4.4 ºC) or below for the recommended storage time,” the USDA explains. How Long Can You Actually Keep Your Food? The mix of dates can be annoying and confusing for consumers. Lawmakers like Blumenthal and Pingree are attempting to clear things up with consistent federal standards for food labeling. But in the meantime, how do you know when your food is safe to eat? For packaged foods, it’s much longer than you probably think. “Canned foods are safe indefinitely as long as they are not exposed to freezing temperatures, or temperatures above 90 °F (32.2° C). If the cans look OK, they are safe to use,” says the USDA. Canned foods can keep for up to two to five years, and about half that for high-acid foods like fruits and tomato sauces. Discard cans that are dented, rusted or swollen. For other non-perishables, like chips, cereals, pastas or any of a variety of pre-made carb-loaded meals and snacks, the issue is less about safety and more about quality. In this case, buy the product by the sell-by date and throw it away when it tastes or feels stale. As far as safety is concerned, as long as the packaging is intact… well, they’re called “non-perishable” for a reason. So when do you actually need to discard perishable food? Short answer: Use common sense. While a cultural obsession with guidelines, rules and right answers might make a lot of people hesitant to guess at the quality and safety of their food, this is actually one place where you can likely trust your instincts. Throw away food that smells bad? That’s kind of a no-brainer. If your instincts aren’t enough to make you comfortable, here are a few basic rules. 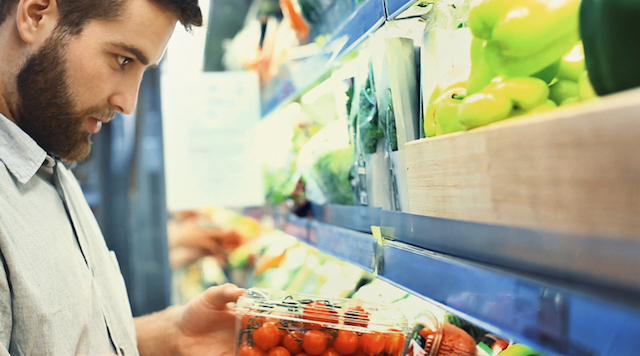 For perishable foods like meat and veggies, you have to be concerned with safety in addition to quality. Unfortunately, food labels aren’t a good guide for that. Instead, follow USDA-recommended food storage and handling guidelines after you bring food home. Here are a few other important food storage basics that can help you keep your food fresh. One caveat: These storage times depend on proper handling of foods, especially perishable foods. If you’ve ever worked in a restaurant, you’re no stranger to additional safe food handling guidelines. Follow these rules at home as well to ensure safety when storing, thawing and cooking perishable foods. Your refrigerator should be 40 degrees or lower. Your freezer should be 0 degrees or lower. Check them with an appliance thermometer. Wrap meat, poultry and fish securely to prevent them from leaking on other foods. Store meat, poultry and fish away from other foods (in their own drawer or on the bottom shelf of your refrigerator, in case of leaks). Avoid cross-contamination by washing your hands and cleaning the cutting board, counter and utensils that touch raw foods immediately with hot, soapy water. Avoid the “danger zone”: Prepared hot foods should not fall below 140 degrees, and cold foods should not go above 40 degrees. Don’t leave perishable food out for more than two hours at room temperature. Consult the USDA guidelines for more details. If you keep a full refrigerator or have a lot of people handling food in the house, day dots could help you keep track of when food is coming in and when you should toss it. Take note when out-of-the-ordinary circumstances threaten the safety or quality of your food. Save Money — Save Your Food! If you follow these simple food handling tips and common sense, you can save yourself a lot of worry over the quality and safety of your food. You can also save a lot of money by not tossing perfectly good food. Also note that while we’re wasting billions of dollars in often-good food, one in seven U.S. families can’t afford to eat well at all. So if you’re just a stickler for guidelines and don’t want to eat non-perishables past their peak freshness, consider donating them to a food bank instead of tossing them in the trash. Your Turn: Are you confused by food labels and dates?